Tried and True: A Closet Full of Helmis! Hi all — I’m Linda and I blog at Ellegeemakes.com. My passion for sewing really ignited when I discovered several years ago that I could sew designer quality clothes that actually fit me at affordable prices! As a petite, waist-challenged person, ready to wear had become an expensive proposition that always included alterations. When I converted my clothes budget to a fabric budget, I began to have a closet of fun clothes I loved to wear. My new love is the Helmi shirt and tunic by Named Clothing, and when I heard this was tried and true month here at the Sewcialists, I couldn’t wait to tell you about it. I’ve made four (!!) Helmi’s over the last few months. You know how it is… one great shirt leads to another. I am such a fan of trench coats, and although I’d seen a few Helmi tunics on other blogs, I didn’t realize the blouse version of the Helmi had trench coat details — a cape, wrist straps secured with D-rings, a hidden button placket. 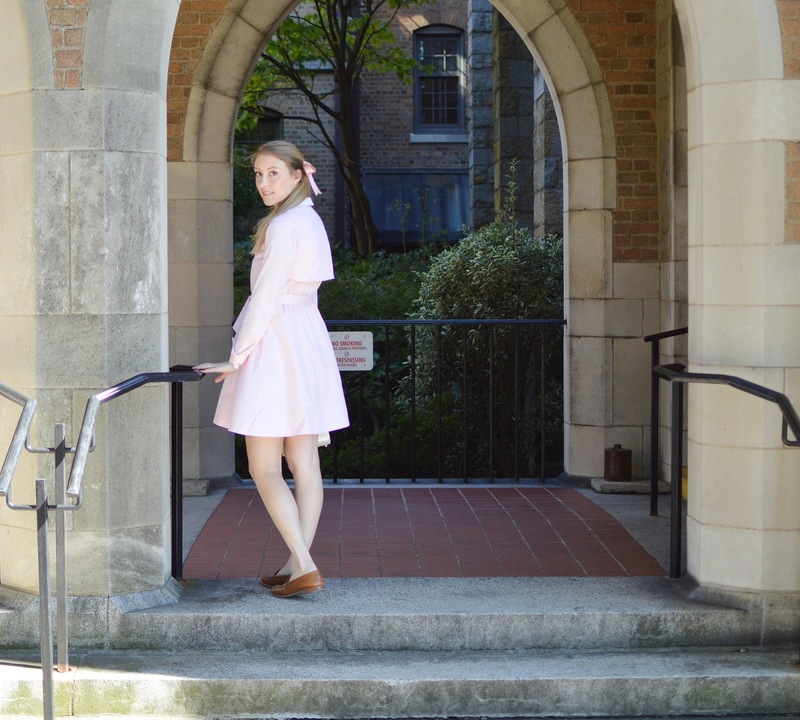 On top of that, it has a perfect peter pan collar… Love! Before committing much loved fabric to this pattern though, I had to do a trial run. My first Helmi was simple from double gauze, without all the trench details. The fit was great right out of the envelope!! My second version had all the details: trench cape and D-ring sleeve closures. After that version was finished, it was time to play. I decided to use the trench cape as an opportunity for contrast. The fabric I used on this version has stripes that decrease in width across the length of the fabric. It was fun to play around with the placement of the various width of stripes — wide stripes on the sleeves and cape add contrast that really makes the trench details pop on this version. My most recent version is a shortened, modified tunic version. Tunics are generally a bad idea for my shape as they don’t have a waist, so I was inspired to play around with the tunic version by Allie M. Jackson’s dress version. As she did, I accentuated the waist detail by adding elastic. I did this by making a casing of the seam seam allowance and inserting elastic there. To hide the elastic waist, I carried through the trench details with a four inch wide belt with a D-ring closure. Then, I shortened the tunic by six inches and added a high-low hem, using the slit markings on the blouse version to cut the ‘high’ curve. For contrast, I cut the Peter Pan collar from linen, and added some simple linen cuffs, skipping the D-ring closure on these sleeves for variety. It’s not just the style that makes me love the Helmi. Even though the shirt includes alot of fun details, the construction is pretty straightforward. AND, who doesn’t love a hidden button placket? Sewing buttonholes are stress free here because NO ONE CAN SEE THEM. Ha! Also, the placket is so simple to construct — it’s created by a series of folds that you press and sew in place, so easy! One other bonus on this pattern — the sleeves just slip into place without a struggle. That’s the sign of well drafted pattern, if you ask me. Four versions of the Helmi — is it enough? Hmmm, I can imagine a a linen version with a cape out of lace… a flannel plaid version with the cape on the bias? Time will tell where this pattern will take me. But one thing is for sure, this tried and true pattern will be used by me again and again, because… guess what, it even looks great under one of my favorite jacket makes of all time — the Named Maisa jacket! Much thanks to the Sewcialists for the opportunity to contribute to this month’s theme. All of you are a constant source of inspiration to me. Happy sewing! TNT Month Instagram Round Up: November 1st-6th! All of your tops are gorgeous! Very nice! I’ve been thinking of trying one of their patterns. I appreciate your sharing! And no, I don’t think 4 Helmi’s are enough. I can’t wait to see your next 4! You are so creative! Thank-you! I agree, there will be many more Helmi‘ s in my future! Wow, I love all of your versions! I wouldn’t have looked at that pattern and thought it could be versatile, but you’ve managed to make them all look really different. I think I like the latest one best, but only because I’m partial to that blue and white combo – looks so crisp! Thank-you! I’m a big fan of blue too, and I can see another version in my minds eye with denim. The blue and white version is lovely! I’m glad you liked my dress version–I think I’ll have to make a top next!